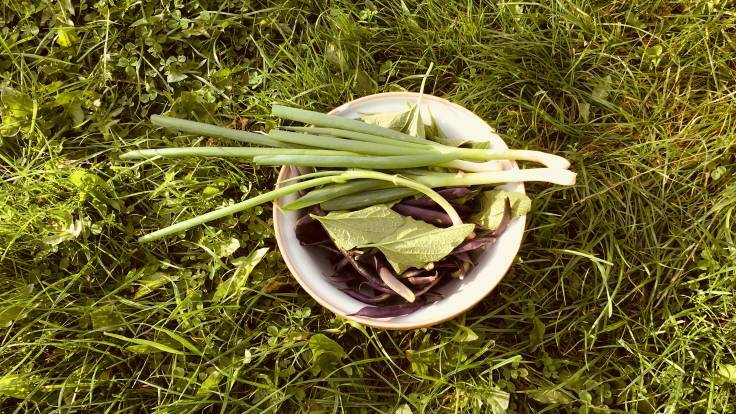 Picked a bowlful of veg for a curry from the #ForestGarden, Good King Henry leaves, Welsh Onions and ‘Cosse Violette’ Purple Pole Bean, in a homemade tomato purée from Grushkova bush tomatoes and spiced up with Alberto’s Locoto chillies. Today, I bulked the curry out with Latah tomatoes and thickened the sauce with Common Mallow leaves. The curry was fab.